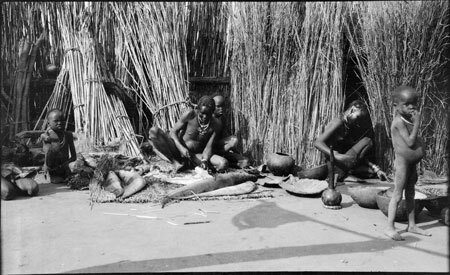 A Nuer man cutting up a large fish with a spear-head on a rush mat, with other domestic vessels and other items (including a gourd water-pipe) nearby. Bundles of reeds lean against the courtyard fence. Morton, Chris. "Nuer homestead life" Southern Sudan Project (in development). 03 Jan. 2006. Pitt Rivers Museum. <http://southernsudan.prm.ox.ac.uk/details/1998.204.5.35/>.